Czech Opera, "Cunning Little Vixen"
What: The Czech Heritage Museum and The Beltonian Theatre in conjunction with The Czech Education Foundation and The University of North Texas College of Music present scenes from the Czech opera “The Cunning Little Vixen,” performed in Czech. Child Friendly. Background: Leoš Janáček composed “The Cunning Little Vixen” in 1924. “This is one of the most delightful operas ever written - a charming, funny, touching story about love and life cycles, based on a popular Czech cartoon series - a sort of ‘Charlie Brown’ of Czech opera,” said Jonathan Eaton, UNT College of Music Margot and Bill Winspear Chair in Opera Studies. 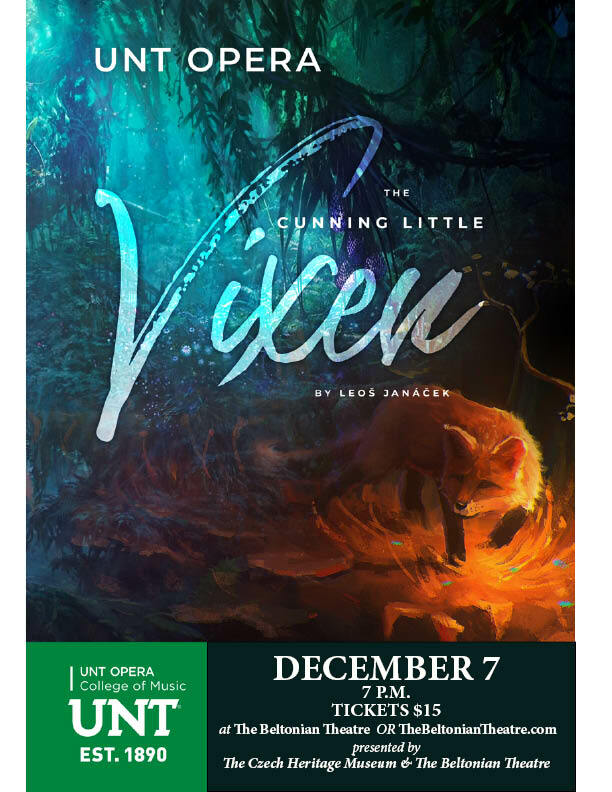 The opera charts the adventures of a charming, feisty, cunning little vixen and contrasts the fierce vitality and exuberance of the animal world with the human world. It's a perfect evening for newcomers to opera and cognoscenti alike. The College of Music is one of the nation’s largest and most respected comprehensive music schools. It offers fully accredited degrees from the bachelor to doctoral levels and is home to the world’s first jazz studies degree program. Faculty include internationally acclaimed artists and scholars in composition, conducting, ethnomusicology, music education, music entrepreneurship, music history, music theory, performance and performance and performing arts health. The college presents more than 1,100 concerts and recitals annually. UNT music alumni can be found around the globe in impressive, award-winning careers across a wide-range of music professions. Czech Film Night at The Beltonian Theatre!